Most animals give birth without any complications. 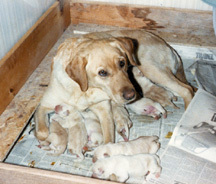 However, mothers occasionally need help with delivery. We usually attempt to resolve the problem using medical therapy first, but when that doesn’t solve the issue, we will perform a caesarean section.